There will come a gap in the strawberry harvest to correspond to the three nights of frost that we had a few weeks back. Still it’s really good to have strawberries before Wimbledon and I have some late cropping ones to provide backup later. They are not going to be loads later as they have already set fruit. The vines which were nipped by the frost are growing on and have flower buds, who knows we might get some fruit this year. I don’t mind there being no fruit as I value the leaves to make stuffed vine leaves at least as much as the grapes. When I visited a local vineyard Ridgeview I wondered at the rows of what looked like plain sided paint cans between the rows, it turns out they had been so worried by the frost that they had been making a smoke barrier overnight; whatever the substance they burn it is in the tins. 2)Pink Geranium × oxonianum a veined pink quite leafy does well in the shade a bit rough and ready for the border. 3)Paler pink neat mound probably Geranium endressii, flowers most of the summer. 4) Geranium procurrens purple with black eye trailing to climbing roots at nodes. 5) Geranium pyrenaicum alba white, self sows, pretty leaf needs firm management. 6) Geranium reynardii white ,lovely grey detailed leaves this is newly brought from my trip to Shropshire where my mother’s friend grows it. 7)Geranium Purple haze Dark purpled leaves and a light mauve flower one flowering in June. Self sows. 9) Geraniumx Patricia Big leaves and showy magenta flowers over a long period. 10)Geranium sanguineum standard bloody cranesbill. Needs the old seed heads removed to keep it in flower. 13)Geranium pratense tall pale blue flowers once a summer may repeat a bit, this is another “probably”, as again it came from seed that was picked in someone’s garden. 16) Geranium orientalitibeticum, low growing, pink, pretty marbled leaves and creeps underground,(badly in light soils sorry Angela! )its well behaved here on heavy clay. 17) Geranium cinereum subcaulescens is a survivor on the parched roof garden. Only the first was in the garden when we moved here five years ago and the others we either brought with us ,begged off others (my father in law is an enthusiast) or have grown from seed. Two were bought from nurserymen and two from plant sales.One came in a box from Woolworths! tomorrow I will post a photograph of some of them. 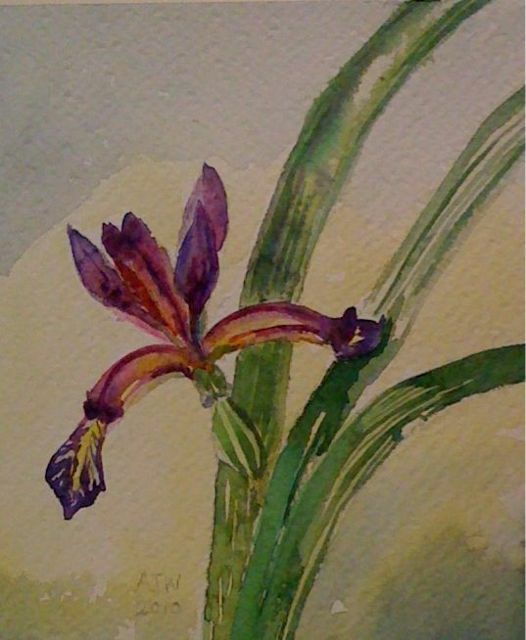 I could not resist another quick sketch of the Iris as it does not last long. Yes there were more strawberries today, they are really very good, there is almost no mould in the patch and as I am removing even the damaged ones,( slugs and or woodlice) there should be no problems with mould until we get some rain. I am still waiting for that nocturnal deluge. Today I went back to the health centre to explore the ‘aqua exercises’. This was less embarrassing than the gym as, in a swim suit with an atmosphere of chlorine, I think that I’m 13, thin, and fit… as long as there are no surprise mirrors. The exercises could have been devised by John Cleese as they were principally a series of silly walks done on the bottom of the pool standing chest deep. I swam a bit as well which is always my preferred form of exercise. Now I am tired and my knee hurts. 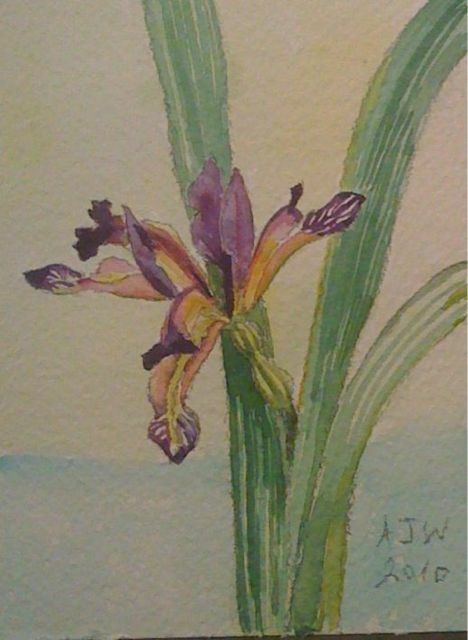 The picture today is of one of the few flowers there are this year on the Iris graminae which I spoke about yesterday. It looks almost Japanese in style, the flowers are below the level of the top leaves. The best place I ever had it planted was in a bed that some steps climbed up beside, the flowers showed up better there and there were lots of them. It was south facing and hot in the summer and the Iris loved it. It also copes however with damp shade (I expect it got a lot of that in Yorkshire). The general design is the same as the big Iris or flag but the petals are all narrower so that the curved petals which point outwards are much more visible (I have just looked them up and they are called style arms and they are not really petals but part of the stigma or female bit of the flower). There is a shocking dryness to the ground and there are things looking sick all over the garden. Watering becomes a bit of an obsession at a time like this. An overnight deluge would suit me just fine. 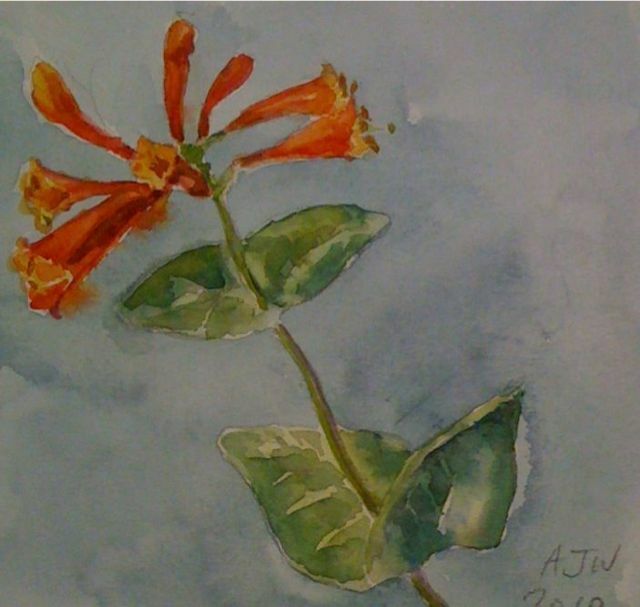 Today I have done a very quick sketch of the beautiful Dropmore Scarlet Honeysuckle. I wanted this for years having seen a beautiful example in a friends garden in Reading, the first one or two I bought died or never grew well. Now however I have a really good healthy plant which is getting bigger every year. Its not in the perfect position though as it was moved from the last garden and put in the ground hurriedly the first autumn. All the geraniums just about are in flower now and they are a gentle delight. I know I should list them but some are unknown. There is Geranium procurrens which is in need of control in one place but doing a good job elsewhere trailing through shrubs. It is said to be one of the parents of G. Anne Folkard and we got it from the garden at Stourton House from Mrs Bullivant . There is a small reliable geranium which is probably G. endressii but a cooler pink than Wargrave Pink. It came from the remains of a compost heap at the back of the garden of a flat I rented in Reading. I must have given some to a friend with a garden at some point as I know the next place I lived had no outside space at all. I love the way good perennials interlace friends and families as they get split up and passed on. 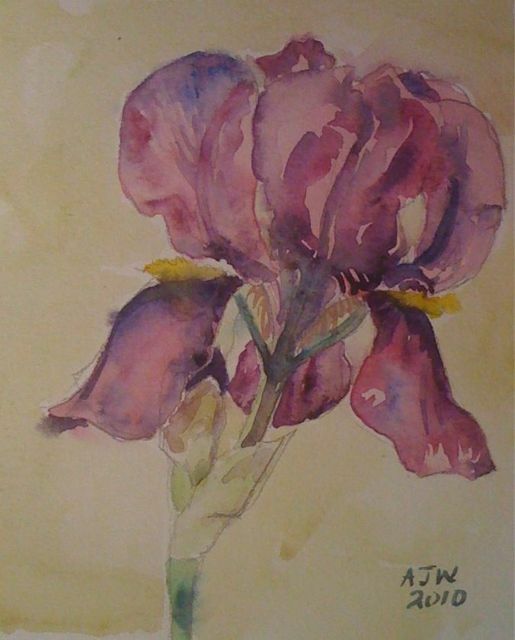 I have an Iris which I begged from my mother as I had loved it as a child. She had it from her mother who had it from either her mother or her great aunt direct. I have given a piece of it to a distant cousin who comes from the same family in the East Riding of Yorkshire. Both our mothers had visited the old house where it grew. I never saw it anywhere else until I spotted it in the Botanic Garden at Reading; it’s Iris graminae. Today I got a punnet of strawberries and there will be at least the same again tomorrow. This is me being a tag tart. 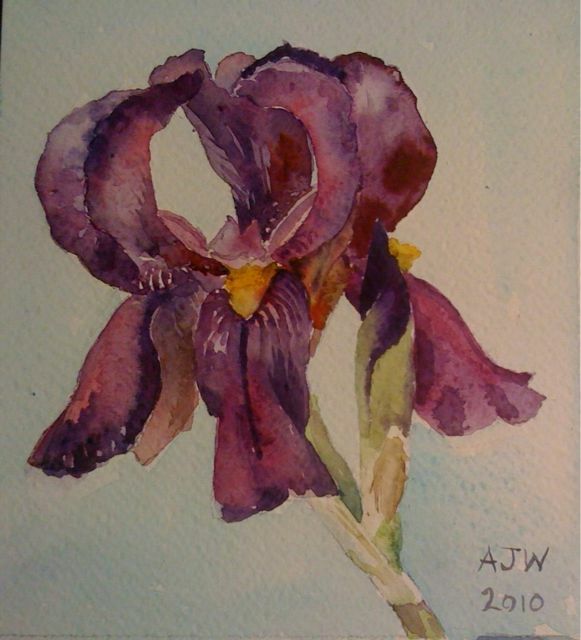 I was so surprised to find that my rapidly put down on paper picture of an Iris got more hits on e-bay than anything else I have offered for sale on its first night that I am inclined to experiment and discover which is the most popular flower image wise. My guess is it will be either a poppy or a sunflower but it could be a lily of some sort. There is a sort of freedom attached to the daily blog thing as you do a picture and move on to the next thing. It seems worth not getting too repetitive in order to reflect the seasons and to entertain the readers /viewers. Ordinarily I might not choose to do sunflowers for example as they can look just a bit clichéd. Having said that, I did put them in the background of my picture of pumpkins that won the prize at the Summer Exhibition in Botswana, and it was a picture I was happy with. 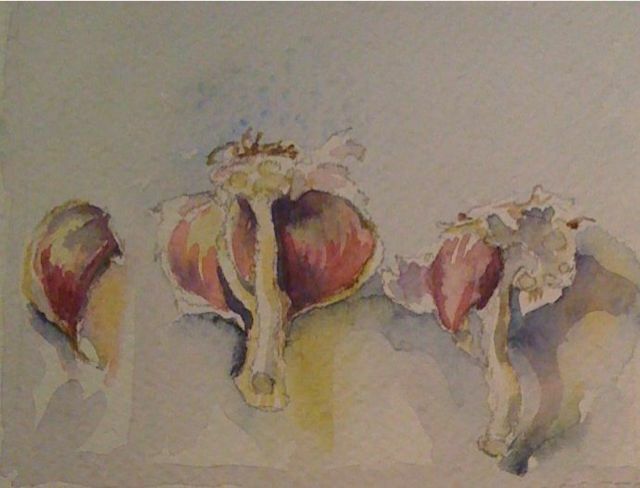 Irises I could paint until the cows come home as they are so interesting . There are three triangular arrangements of three petals, three standing up, three falling downwards and three reaching out. Then to make it even more complicated there is the beard which could be a tiny upturned scrubbing brush if it weren’t for its clean gold colour. There are also the spiralling buds in a colour so dark I always think I’ve got a black one until they unfurl. 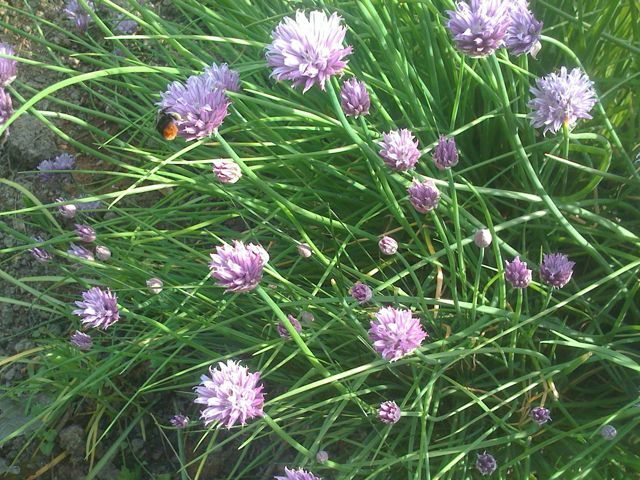 I include here photo of one of the best garden Alliums for floral display…the star of the backdoor bed …I give you the humble and very useful Chive! Also a picture taken, on a sunny day, of the half moon border; the pansies are a proper purple yet they look an inky blue in this shot (and all the others I took) Today’s painting, an Iris given longer to develop on paper, is actually rather bluer than it has photographed. That is most likely a problem with the artificial lighting but the pansies were taken in daylight so should come out closer to true hue. The other thing I did today was to go to the gym to get some help with my knee problems. Not really my natural environment, I said I’d never been before which the instructor found hard to believe.” What not even when you were younger …at school?” she said, I looked at the rows of grey and black torture apparatus and had to say “I don’t think any of this had been invented when I was at school”. I mean we had a dusty old leather horse that you could be asked to jump over, but it was definitely not cool to do so with any sort of skill. If the Gym Mistress did not roll her eyes in despair, you had failed dismally. I tried not to be too gloomy and did my practice five minutes on everything but I really can’t imagine how people manage to go to the gym for pleasure. Afterwards my knee hurt and I don’t think it is supposed to. Well apart from the fact that my blog provider appears to have forgotten who I am… or a child has done something to the computer that means that I am not cookie friendly with the blog provider anymore it’s been a very mixed day with some good parts. The shed is in the main intact and resurrected in a new position behind the garage. This is a good thing for the garden for the shed, being very cheap for the size, is not a thing of beauty. The only sheds that are things of beauty seem to be either very old and about to fall down, or very very expensive. The forget-me-nots are all going over and need pulling I have started on this job and can see that once I have done the forget-me-nots I will be going back for the Geranium pyrenaicum which is getting too frequent in a number of beds. 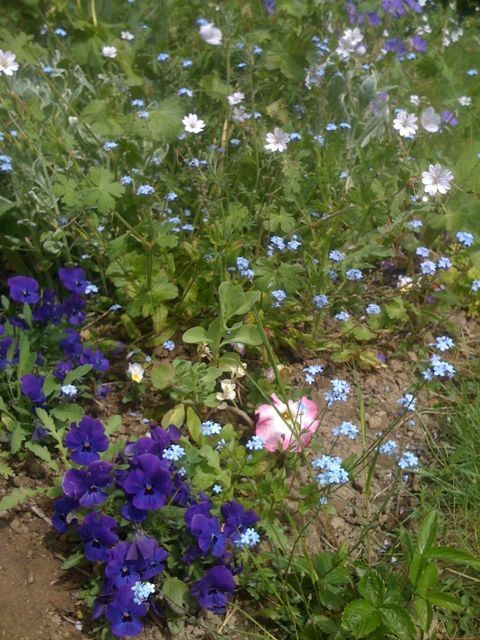 I tackle the forget-me-nots on a need to cull basis…the tattiest ones go first and then I will clear a patch where something else needs planting, By the next day another lot will need taking out.